Richard Marquis's retrospective exhibition at The Corning Museum of Glass; Ruth King moves on after nine years as Pilchuck's artistic director; Sibylle Peretti receives $50,000 United States Artists Fellowship; Kirstie Rea returns to her Canberra roots; Holly Hotchner steps down as director of the Museum of Arts and Design; The Glass Art Society cancels its 2013 conference; performance art takes center stage at the Chrysler Museum Glass Studio. Stephen Rolfe Powell at the Montgomery Museum of Fine Arts, Montgomery, Alabama; Esque Studio's Andi Kovel & Justin Parker at Wexler Gallery, Philadelphia; group jewelry exhibition at Claire Oliver Gallery, New York City; Jeffrey Sarmiento at Ken Saunders Gallery, Chicago; Ron Desmett at Kim Foster Gallery, New York City. An update on the reNEWal project at UrbanGlass; the UrbanGlass education program kicks into high gear. 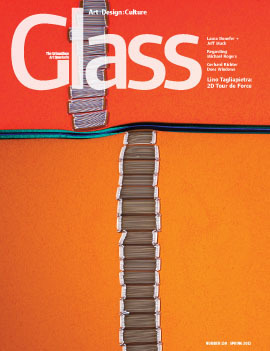 Gun Play: Does glass weaponry force us to rethink our complex relationship to firearms, or desensitize us to a dangerous American obsession? Lino Tagliapietra's works in flat glass are as introspective as his blown vessels are vivacious, and they represent the artist at a transformative moment in his storied career. The exuberant Laura Donefer moves beyond flameworking to an alchemical collaboration with her polar opposite, the glassblowing virtuoso Jeff Mack, to achieve classical vessel forms that shimmer with vitality. Gerhard Richter uses glass panes to challenge perception itself.